Melissa Volpi graduated in 2009 with a BA (Hons) in Photojournalism from London College of Communication. During her three years in London, she completed work experience placements at two IPC Media publications, Horse and Decanter, and was editorial assistant at Sporting Shooter magazine. She has travelled the world as a freelance writer, photographer and photojournalist and documented everything from gun making to confidence boosting riding holidays for women. Melissa has had work published in Horse, Sporting Shooter, Sporting Rifle, The Countryman's Weekly, Gun Mart, Shooting Gazette, Scotland, Shoot in Scotland, Scottish Field, Shooting Times, Horse & Rider, Scottish Rider, The Native Pony, No.1, Countryside, The Field and Frost in the UK. The Chronicle of the Horse, Gray's Sporting Journal, Sporting Shot and The Chronicle Connection in America, Voyages de Chasse in France, Luxury Aficionados in Denmark, Halali in Germany, Guns & Game in Australia, and New Zealand Guns & Hunting. 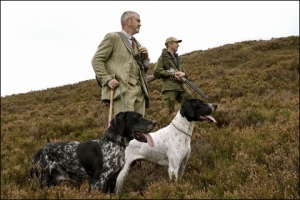 In 2013, Melissa toured Scotland to document the work of female ghillies and gamekeepers. Her photo-essays and written articles on these Scottish women are published around the world. It was down to her admiration of female ghillies and gamekeepers that Melissa started an online networking community for professional women called Females in Fieldsports. She is currently developing this idea into a magazine column and book. You can visit her web site at http://melissavolpi.com . Scooby stands at the highest point of Crubenmore (a 3,000-acre beat on Drumochter estates, which is part of the Cairngorms National Park). He breathes in this mysterious landscape – with its light grey sky, patches of bare rock face and carpet of short muted heather – hoping to catch the scent of grouse.